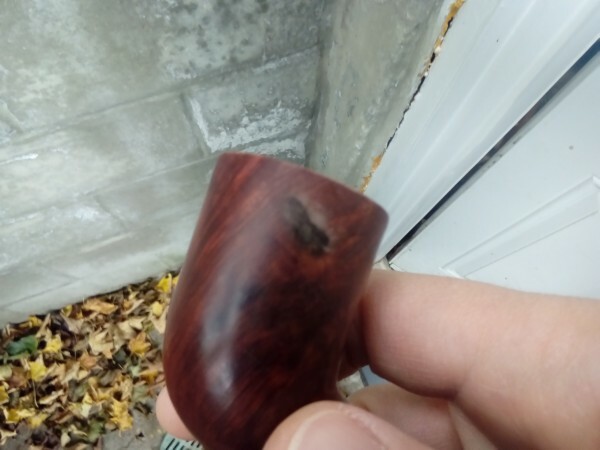 Anyway, is there a way to remove the burn without re-doing the whole pipe? I thought I would ask first but I'm guessing that the entire bowl needs to be refinished. IMO it’s time for a complete refurbish, someone who works with stain on a daily basis, has a ton of experience AND is actually good at it could make it presentable. It would be easier,faster and look a lot better to strip and refinish the whole thing. Wow, how long would you have to hold a cigarette next top the bowl to get it to burn like that? I mean, carpet and shirts is one thing, but that would have to be one hot cig left resting on the bowl to do that. One of the qualities of briar that makes it great for smoking is that it doesn't burn easily. It looks more like someone laid down their blowtorch carelessly next to their pipe. I imagine it happened in an ashtray. Either the piper was careless, or the ciggie smoker or both. Ugh. Too bad it happened. Hmmm, I have a briar ashtray that I set my cigars down in, and it has never burned the briar. Do you really think a cigarette could do that? I'm just thinking that even after smoking one bowl in my pipes, the inside of the pipe isn't charred, especially not that much. It always cakes over, before charring. I just find it hard to believe that a little cigarette could do that, even if it set on there all day. You could be right. I'll not run the experiment though. I've found that these type of burns go deeper than you think. You can try sanding lightly on the spot and see if any comes off. 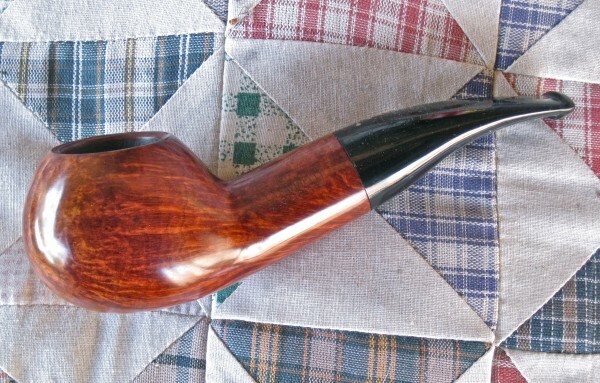 But then you're pretty much committed to refinishing the whole pipe. 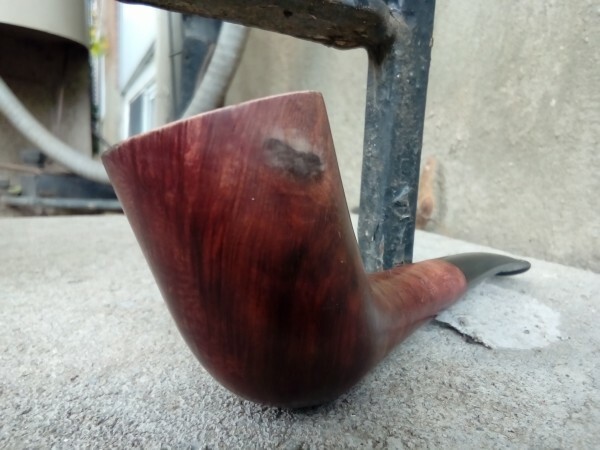 The easy way would be to try to sand the spot and the area around it trying not to change the shape of the bowl, and then re-stain the pipe a darker color to hide it. Also check on Reborn Pipes website to see what info they might be able to furnish. Good luck! I doubt the story, no offense to you, but as mentioned above, that could go much deeper than you think. I would trust a professional. This is only speculation, but the shape of the burn suggests something more like an electric stove-top burner than a cigarette. Is it still smooth? It looks in the picture to be almost indented. I hope not. No offense taken at all, the story wasn't mine. 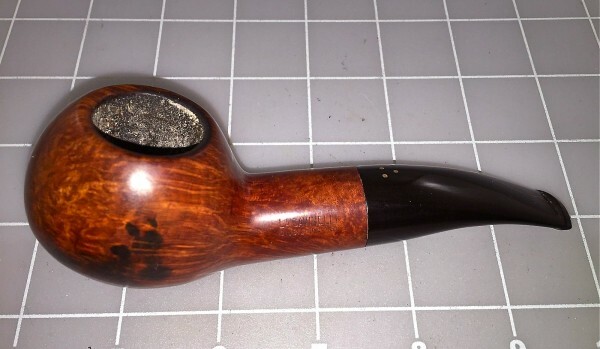 I bought the pipe this way for a very reasonable price. 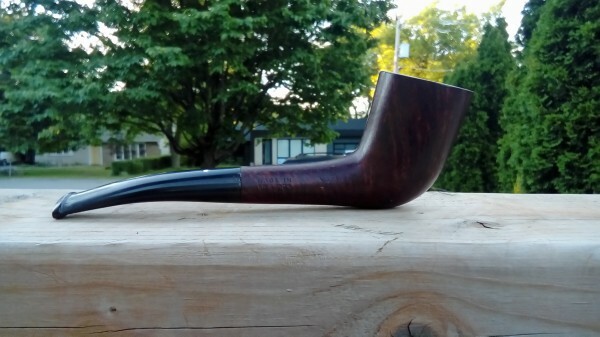 The seller was NOT a pipe guy. The story of the cig burn was from my other thread that's all. Looks like a complete redo is in order, as I originally thought. What shape is that pipe? Or Dublin. Either's copacetic with me since I like them both because they're so similar. I'll not run the experiment though. Oh, come on, John, wouldn't you like a new hobby? Do you really think a cigarette could do that? Yes. Quite easily, in fact. Cigarettes used to have chemicals added to keep them lit. 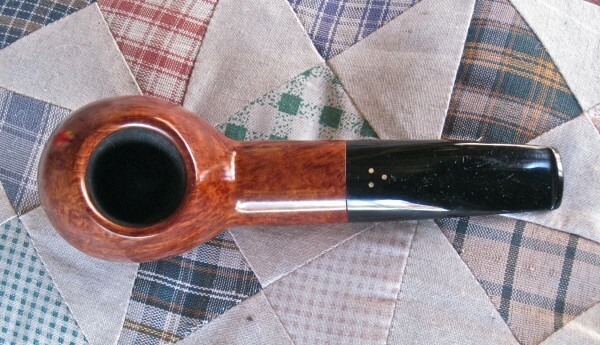 When a briar bowl leaned on top of one in an ashtray, a blackish mark/stripe was the result. If the OP's pipe was burned in that way, the darkening goes a lot deeper than a refinish will fix. I think the spot gives it character! I'd be more worried about you setting it on the concrete! Well if George says a refinish won't erase it I guess I have to live with it. I'd be more worried about you setting it on the concrete! Just balancing to get some good light for the photos. I removed it before a bonsai sprouted from the bowl. I guess there is no way to minimize it without removing finish. I will try to clean it up the best I can and eventually try to polish it up some. It is in such great shape aside from that mark. Thanks guys. Good to know about cigarettes. I wouldn’t have wearied setting my pipe in an ashtray. Now, I’ll be more diligent about smoking around cigaretters. All correct, and as others have chimed in. Those marks run pretty deep and to truly get it out completely, you almost always have to change the shape of the bowl Perhaps you could compromise with getting most of it out, then using a dark stain to disguise the disfigurement. Well a good clean and wax, then I will live with it. Yeah, if you like the shape just deal with it. As long as it isn't a burnout waiting to happen, there is no reason to worry about the mark. Or you could find a small gold or silver piece to glue over the spot and say it's a special edition Dunhill! The inside of the bowl looks fine. As far as I can tell it is only cosmetic.